Had a brief spell of chest pain over the weekend. Okay, nothing to be concerned about. Or is it? Is that normal for a twenty-nine year old? So I’ve been jumping on the exercise bike every day *waits for applause*. Yes, for four minutes and twenty seconds each day *applause stumbles to a halt*. I’ve come across this android app called Caynax HIIT, and I’m using the routine called Tabata, where it beeps at me for twenty seconds (to tell me to pedal so fast that my withered little heart explodes into a paste all over the inside of my chest cavity) and then beeps differently for ten seconds (to tell me to pedal slow and let my heart re-assemble wolverine style). 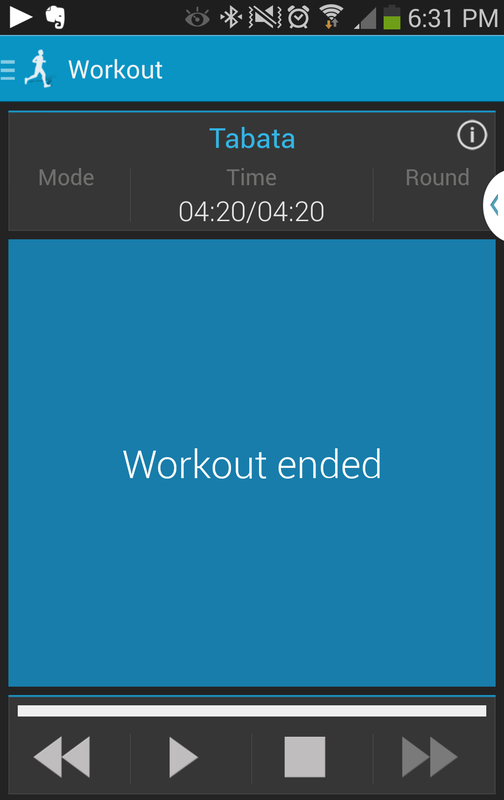 What good exercising apps do you guys and gals use? As for my writing, I’ve been writing some almost montage kind of stuff. We must all know that the heroes and heroines in our stories work out. They probably don’t aim for six packs, but they’re definitely trying to develop power, endurance, and strengthen around all the joints they’ve probably injured… I want to use this as a time to develop the characters, both personality and back-story (because if I can’t somehow get Eye of the Tiger onto the page, there’d better be some other kind of pay-off for the reader). I think that’s a good take-home message: if you’re putting something in the story it had better either build character, or advance the plot. What are your thoughts on exercise in fiction? Ever seen it done well? This entry was posted in Fitness, Writing and tagged Apps, books, characters, exercise, Eye of the Tiger, fiction, HIIT, Montage, Writing. Bookmark the permalink. Glad to see you’re back on the bike 😉 I have no real hints for exercise in fiction, although I do know that I hate it when a writer stuffs up the technical terms or has no real idea what they’re talking about for sports/hobbies/occupations/locations etc. Ahhhh! “Back on the bike” would have been a much better title for this post… nevermind. I would definitely talk to a doctor about the chest pain if it continues or becomes severe. It might just be heartburn, which often feels like chest pain. They have medicine for that over the counter. Proton pump inhibitors (Prevacid) if it is pretty frequent and Histamine 2 blockers (Zantac) if it’s only occasional. Tums are a good short term antidote. Hahaha sounds amazing. My wife did her training at Le Cordon Bleu, so it’s all Opera Gateau and Coffee Eclairs and Macarons. I have a jar of Florentines sitting next to me on my desk! I am lucky to still have a fairly quick metabolism, so I’m still technically in the healthy weight range, and lifting weights does seem to keep fat down pretty well. Ah okay. Yeah we met in Scandinavia, both on holidays, so that was quite unusual I guess. We’d love to go work and live overseas too, but we will have to see how much of a pay cut that would be before we decide how long we’d go for.